On January 31, 2012, a bipartisan group of Senators introduced a bill which seeks to transition from $1 bills to $1 coins in order to save taxpayer money. The bill S. 2049 was introduced by Senators Tom Harkin and John McCain, and cosponsored by Senators Tom Coburn and Mike Enzi. The Treasury Department recently implemented a suspension of production of Presidential Dollars for circulation. The move was announced by Vice President Biden and Treasury Secretary Timothy Geithner as part of the Administration’s Campaign to Cut Waste. Federal Reserve Banks hold an estimated 1.4 billion dollar coins in surplus, and it was estimated that the amount would have grown to 2 billion if the Presidential Dollars had continued to be produced for circulation through the conclusion of the program in 2016. The Treasury Department indicated that the suspension would yield annual savings of $50 million over the next several years. The group of Senators who introduced S. 2049 the Currency Optimization, Innovation, and National Savings Act (COINS Act), cited potential longer term savings from phasing out the $1 bill in favor of the $1 coin. Although the coins initially cost more to produce than bills, savings would be generated due the longer lifespan of the coins compared to bills. A recent GAO study was estimated that the savings would be $5.6 billion over 30 years. A news release from the Senators noted that virtually every modern economy has made a similar transition to higher denomination coins. The release also stated that when the Canadian government switched the the $1 coin, the move generated savings at a rate ten times the initial projections. The COINS Act introduced in the Senate is a companion bill to H.R. 2977 introduced in the House of Representatives on September 20, 2011. The House bill currently has 12 cosponsors and has been referred to the House Committee on Financial Services. Let’s see if these guys can get this past Crane’s & Co.’s lobbyists. I’d love it if it worked, but I think it’s pretty unlikely to happen. CO, I think you’re wrong. I think they will do this. Not only will they transition the $1 bill to coins but they’ll change the metal content of both the nickel and penny. Since new legislation and new coins are being introduced its sooooooo obvious that “change”, pun intended, is in the air! However, my thought is with the removal of the $1 bill how much of a premium as a “collector’s item” will they demand? The Canadian dollars no longer in circulation are worth more than their face value. This makes sense, should have been done a long time ago (1979 to be exact). The change of composition for the cent and nickel makes no sense whatsoever, any minor savings is offset by the costs involved in making the change, especially one to magnetic materials. Either leave the cent and nickel alone or eliminate them. @Clair, have you seen, felt and or held the Canadian steel pennies and nickels? If not, find one and then you’ll see. I am not in favor of the change/s. However, they will NOT eliminate either the penny or the nickel so I can only surmise they will ultimately change their composition. As I stated earlier, change in the circulation money supply is coming, it may be slow but it is on the horizon. Well gang,if we do change from paper to coins,then I hope the coins will be a little lighter. Carrying a large amount of coins in your pants’s pockets is cumbersome,in my opinion. But then again it might just take adapting to the practice. Maybe I’m different, but I rarely have more than 3 or 4 one-dollar bills in my billfold at any one time so it stands to reason that I would never have more than 3 or 4 dollar coins in my pocket. I can live with that. Besides, $1 is roughly equivalent in value to what a quarter was in the 1960’s and no one complained then about carrying too many quarters. I say… kill the bill!! Kill the bill, the penny, and the nickel. We didn’t need coins with so little buying power in the 60s and we don’t need them now. A dime today has the value of a penny then and we did just fine. Having all these worthless pennies and nickels in my pockets is far more weight than the dollar coins would be. It would be nice to actually have useable, sensible coins in circulation. up the United States of America’s dominence in the World Currency exchanges. Indeed–kill the one dollar bill and use the dollar coins. BUT, also dramatically increase production of two dollar bills. This should keep the paper money supply company happy, and appease those who worry about carrying too many coins. And I’m with old folkie on the coins–when the U.S. dropped the half penny, it was worth approximately $0.10 in current dollars. Lose the penny and the nickel but keep prices denominated in cents. People will adjust. Change over to a dollar coin instead of paper makes too much sense. That is why it won’t happen. Forty years ago I used change for cash transactions on a daily basis, as so many purchases were for less than a dollar. Today, virtually no cash transaction is less than a dollar, and I no longer carry change less than a quarter (need them for parking meters and for splitting the lunch tab to the nearest half dollar). Maybe eliminating the dollar bill will get people back to using coins again, instead of them just stockpiling up at home waiting for a semi-annual trip to the bank or a coin-star machine. The new coins will save dollars, yes, but they will not generate buying powers as did silver coinage and a dollar back by a gold standard. That is why you could by products and services using pre 1964 coinage. A coin may have had a numisitic value of 25cents, but that silver quarter in todays silver worth is around $6-$7. Understand? Our dollar,paper or steel is now backed up by GDP, not by a PM. Actually giving the penny and nickel its true intrinsic value would be a start, considering that pennies 1982-1909 are worth 2cents a coin, and nickels hover above 5-7cents annually. This would bring up the real use of coinage since you get more bang for your buck. 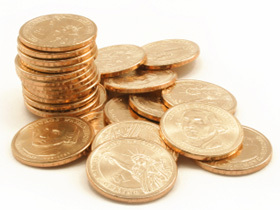 Get paid in pennies and you would have twice your pay. A natural stimulus would be a cause and effect, and yes after a certain period of time copper would flucuate, but then that what saving is for, leaving a demand for a resource in the market would help raise back the initial copper value. This would also teach a valuable lesson to our people since it would give the public a control on the market, notto a centrally planned one as we have today. The government spends about 9 billion a day and this will save 5.6 billion over 30 years? That is enough money to run the government for less than a minute. The only way dollar coins will work is if we aren’t given a choice by removing the paper dollars. Politicians are pretty good about giving the people no choice. So they should just stop talking about it and do whatever they are going to do. Coin articles states that cost studies prove that it cost more to produce a CENT and NICKEL than its FACE VALUE. Economic (cents) sense, where is Congress? As usual stepping over $s to pick up a CENT and/or NICKEL. All in favor to get rid of CENTS, NICKELS and PAPER DOLLARS.